Appearing with St Albans Symphony Orchestra and its conductor Bjorn Bantock, Magnus will play the beautiful and classically-proportioned Violin Concerto by Beethoven. The work is remarkable for its spaciousness as well as the different textures that the great German composer created as his memorable themes are passed between soloist and orchestra. Magnus Johnston will be playing the work on a violin that pre-dates Beethoven’s work by as much as a century and was made by Girolamo Amati, known as Hieronymus II, in Cremona, Italy. His use of this rare instrument has been made possible by what he describes as “unbelievable support” from his parents Gill and David Johnston, the co-founders of Harpenden’s Musicale centre for young musicians, alongside other investors. As well as his solo work, Magnus has built a distinguished career as a chamber musician. With his ‘cello playing brother, Guy, he founded the prizewinning Johnston Quartet (now known as the Elias Quartet) and the Aronowitz Ensemble. 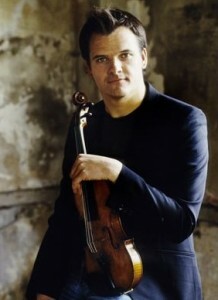 Since 2010, he has been a member of the internationally-acclaimed Navarra Quartet. Separated from the Beethoven concerto by a hundred more years, the second major work in SASO’s concert is Debussy’s most famous work, La Mer. Described by the composer as ‘three symphonic sketches’ the evocative depiction of the sea in different moods has inevitably been compared to the vibrant work of his artistic contemporaries, the impressionist painters. Although he started his composition in France, Debussy memorably completed it during a 1905 English seaside holiday at Eastbourne. Further colourful contrasts will be provided by the spirited Festive Overture by Shostakovich. This officially marked an anniversary of the Russian revolution – though some suspect it was the composer’s private way of celebrating the death of Soviet dictator, Stalin. There will also be performances of the opening fanfare that French composer Dukas wrote for his opera La Péri and the wistful tone poem Swan of Tuonela by Sibelius, featuring cor anglais soloist Karen Mason. Tickets: £14 (nave) and £10 (aisle), £1 (accompanied under-18s) and £5 (students) from the SASO Ticket Secretary (01727 857422), tickets@saso.org.uk; or online from allaboutstalbans.com (booking fee applies).